Within minutes we were at Volvat, panting as we jumped up onto the crumbled platform where Siologen had slept back in October. Another train sped past; we ducked into the stairwell up to street level. Volvat had been a stop before the Oslo system converted to proper ‘metro standard’ in 1995, with a third rail and a ‘splorer magnet. 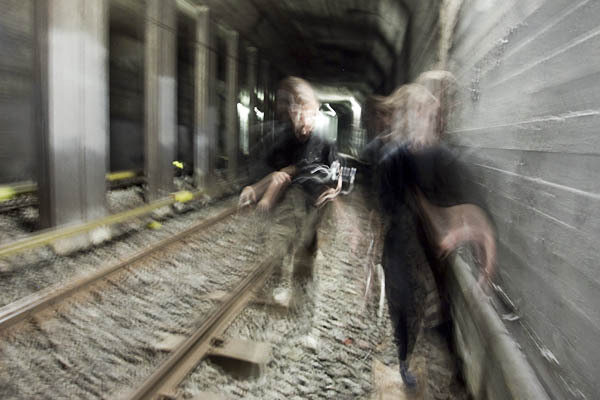 In 1997 the trains on the Kolsås line started bypassing it too, and T-Banedrift must have just boarded it up and forgotten about it. Volvat didn’t have a great deal going for it, but it was a fun warm up. After hiding for 10 minutes from a drip from the ceiling, we realised that nobody was there and legged it out following another train running through. Valkyrie Plass was more interesting. 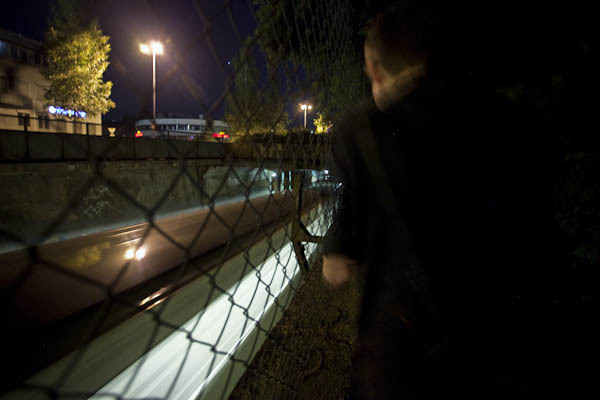 We waited until what seemed like the middle of the night, paying about £4 for a 1.5ltr bottle of Coca-Cola, before bopping off the platform at the nearest station and running down the tunnel to the station. Nervy at first, we had to hide as a worker walked across the portal and took a good look down towards us. 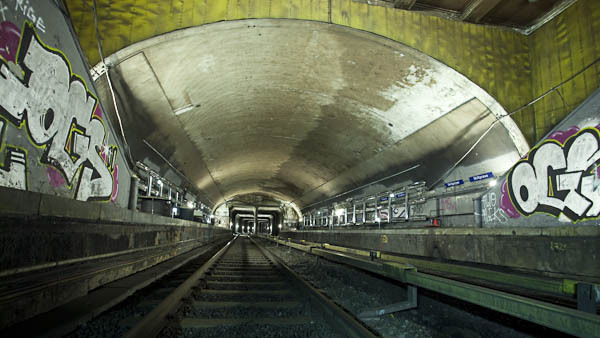 After a short while, we returned to the platforms, before walking up the tunnel to where it splits fully again. 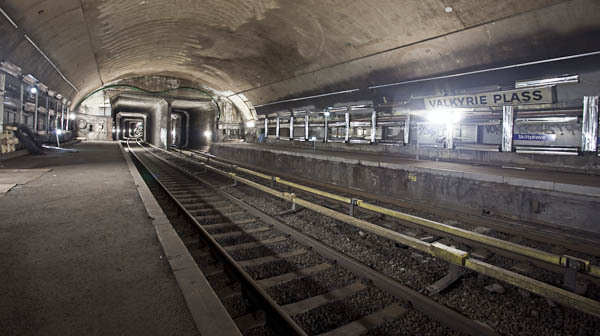 Valkyrie Plass was only built because during tunnel construction, a rockslide occurred and a void was left – it was decided to build a station in the gap despite Majorsteun being little more than 200m away. T-Banedrift eventually closed Valkyrie in 1985 when they realised it was pointless. Access from a portal is always nice, it’s very linear. You’re either in the system or you’re out. When the worker started poking his head around, we felt safe in the knowledge that there’s an exit through the shop above. 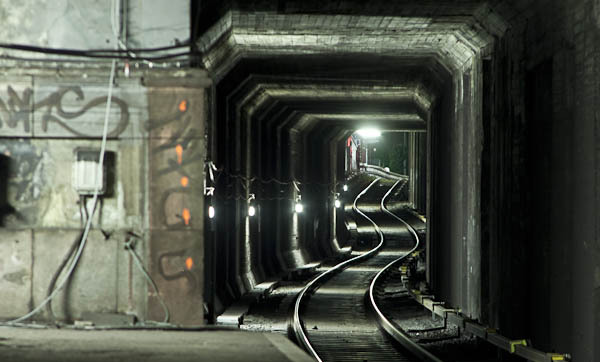 We didn’t test it in the end, preferring to return from the tunnel we’d come from. 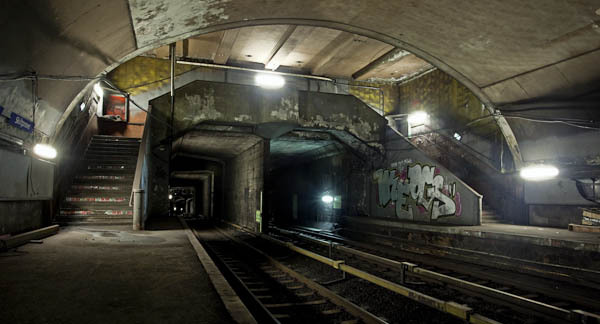 T-Bane was reminiscent of Paris Metro in a way. Nice wide tunnels and stations you can run off the end of. 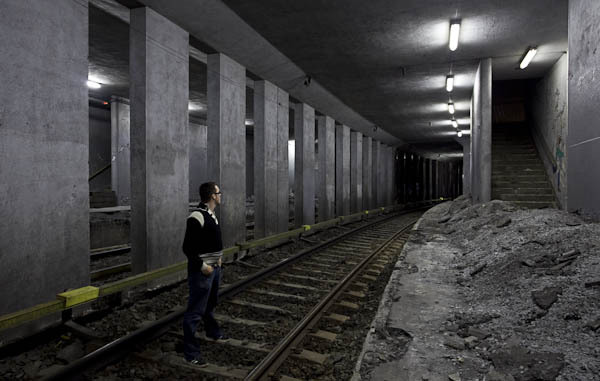 T-bane isn’t really underground – for the most of it, it’s a regional railway network, it’s just the centre of Oslo that has underground stations. There’s a few junctions underground, but we had other plans and didn’t make them the priority until it was time to go home. The next night we went to climb the Fjordcity cranes, but the guard on site was walking to each crane in turn, looking up it, stepping back 20 foot, looking up it again, before continuing on his never ending patrol with his Alsatian. The local music festival was emptying out and the area was busy enough as it was. Dejected, we returned to the main station and checked the timetables for trains running through the Oslo Tunnel. It appeared that they stopped at around midnight, so we got the T-Bane and then walked forever to get to the portal for Elisenberg stasjon. By 1.30am, the tunnel should have been dead, but trains just kept coming through. Elisenberg is an unfinished mainline station one kilometre up the tunnel towards Oslo, and every train going south or west from Oslo Sentral runs through here. We hid in the bushes and long grass between two lines to watch the trains, trying to assess when it was safe to go. They kept coming. A track worker walked past no more than 10 foot away as we lay trying to be silent. Another few trains passed, so we made the decision to cross the tracks and watch from the public land until later – It seemed quiet enough to. 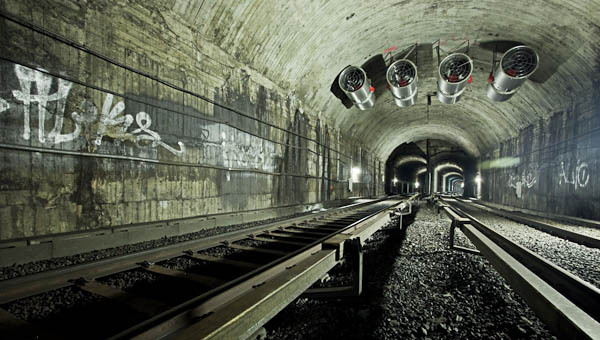 When the signals all turned red we got up to cross the track, and in the mouth of the tunnel was another worker. We legged it, then watched from the top as he searched the bushes for more of us. Knackered by this point, we returned to our little rocky hill and lit a fire, before sleeping sporadically before the rain woke us. With all of us feeling shattered on the Sunday, we elected to make another fire before it pissed it down, forcing us to return to the busstasjon to await our coach back to the airport. « Brad:Pad: LCC’s London Squat. Subscribe to comments with RSS or TrackBack to 'Oslo T-Bane'. Thanks Tommy, maybe next time! 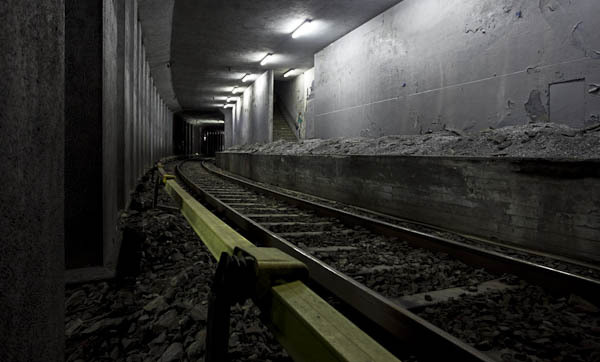 When they built the underground from Nationaltheatret to Majorstuen they intended to build a station around the middle between the two – but decided to build it in Valkyrie plass when the tunnel caved in there. There has been some talk about building a station in the middle some years ago – «Homansbyen» – but at the moment I think it is considered too expensive. Valkyre plass was closed not only because it was very near to Majorstuen, but because it was too short for the new trains.